Enjoy 5 magical nights on Moorea: the “Magical Island”. Because of its stunning scenery and heart-shaped formation, it's no wonder so many people fall in love with Moorea! Arthur Frommer declared in the travel guide that he considered it the most beautiful island in the world. Here, you'll find the real South Seas' experience - a casual, barefoot existence amidst white sand beaches and multi-hued lagoons surrounded by jagged mountains and volcanic spires. 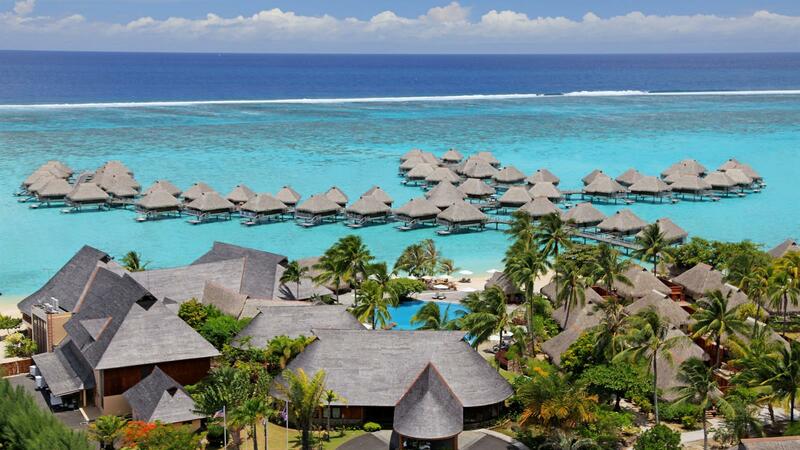 Choose from 4 Moorea resorts: the Sofitel Moorea Ia Ora Beach Resort, Manava Beach Resort & Spa Moorea, Intercontinental Resort & Spa Moorea or the Hilton Moorea Lagoon Resort & Spa with Full Breakfast daily, a Tahitian Black Pearl Gift, Exclusive Bonuses e.g. a Free Dinner for 2 or a Resort Credit at select resorts. International Airfare, Inter-Island Ferry round trip and Airport Transfers included. All Package prices are per person, based on twin share. Enquire for Single supplement. All Room/Bungalow upgrade prices are per person and based on the entire length of stay at the resort(s). To upgrade for example to an Overwater Bungalow, simply add the upgrade cost to the base package price. If you prefer to upgrade for perhaps just 1 or 2 nights of your stay, please request this option. Upgrade to Business Class Air round trip from Los Angeles to Tahiti is available. Please enquire for the additional cost.